TEST PAGE FOR TEA AND CARPETS. PRAGUE, December 5, 2008 -- One way the Internet is changing the oriental carpet business is by giving rug lovers the chance to directly contact producers. That has not always been so easy. Traditionally, customers have been separated from producers by numerous other people. The intermediates include wholesalers and retailers who, for their own good reasons, like to keep the names of producers vague or secret. After all, who wants to be bypassed? But now, anyone can find the names of rug production houses by simply doing a word search. 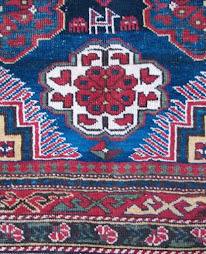 A little Googling tells who produces Persian, Turkish, and Caucasian carpets, the subtypes they specialize in, and whether they use machine-spun or hand-spun wool. 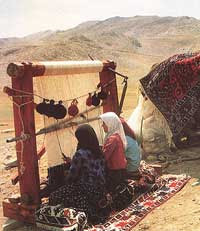 And that opens a whole world of possibilities for people to directly commission their own carpets. If a producer agrees, one can even design one's own carpet or, more realistically -- because designing requires considerable experience -- modify an existing design to suit one's taste and fancy. For those who want to play with designs, the first step is choose a model -- perhaps from a favorite rug book. 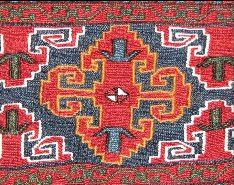 Here is a Karabagh Tree of Life design taken from "Caucasian Prayer Rugs" by Ralph Kaffel (1998). Now comes the challenging part. That is, finding a high-quality producer who works with the kind of rug type you like and who is willing to accept a single bespoke order. Usually, bespoke producers will welcome commissions to produce large-sized rugs, but they are less interested in small-sized ones. And it is the smaller scale pieces that may best suit the individual customer because he is also going to have to pay the shipping and customs fees. One artisan who is reviving traditional Caucasian carpets in Baku, but who is also willing to entertain single rug requests, is Vugar Dadashov of Azerbaijan Rugs. 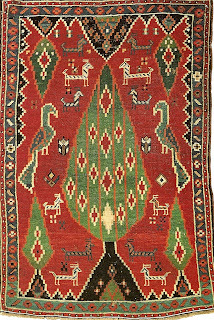 Like many producers with a sophisticated web page, he has become used to attracting the interest of not just retailers but individual rug lovers, too. In the case of the Karabagh Tree of Life above, Dadashov saw no reason to refuse even a very unorthodox request. That was to let a child modify the design by choosing her favorite color for the background. The color choice? Yellow. Yellow, of course, is not a color you usually see a lot in Karabagh rugs. But Dadashov and his designer accepted the whimsy of a child's world and in a few weeks mailed a cartoon of the modified design for inspection. The cartoon flew airmail in an envelope covered with colorful postage stamps -- something as rare for a child to receive in this day of e-mails as, well, a letter from Azerbaijan. After that, the project was in the hands of a single weaver. The weaver was just one woman because Dadashov believes reviving Azerbaijan's best rug-making traditions means letting weavers work again from their own homes. That restores individuality and, in the case of the yellow Tree of Life, makes one wonder how many design changes over the years came from women entertaining the whims of their own children and friends. Weaving always takes months and one's anticipation rises steadily during that time. How much will the paper design change as it is transformed into a three-dimensional, pile rug? How different will the colors of the dyed wool be from those of crayons and colored pencils? For adults commissioning a rug, these questions are entertaining enough. But for children, they are magical as they open the imagination to distant lands and ancient traditions. And then, finally, there is a e-mail photograph of the finished rug. It is different from the design in many ways, yet also the same. In the upper-right is one more surprise: the child's name and the weaving date of the rug in Persian script. The remaining step of actually getting the bespoke carpet home offers a quick education in several aspects of international commerce. That includes the relative per-kilo costs of shipping via a foreign postal system vs. an international courier service. And, more interestingly, it includes learning about customs tariffs and where to collect duty-payable packages -- something that can take you deep into the heart of your own local postal system. Still, one will emerge wiser and better informed about the rug trade. One will learn that some imports -- like Afghan goods -- are virtually customs free because of bilateral government agreements to help develop Afghanistan's economy. And this, along with relative labor costs, is another reason why carpets from different countries can vary so greatly in price. After that, there is only one more decision to make. To follow the trend by ordering more bespoke rugs, or to go back to shopping retail.